The pinnacle of Kings Canyon lodging, the John Muir Lodge is a stone-and-timber retreat located in Grant Grove Village and within minutes of historic Grant Grove and its towering forest of giant sequoias. 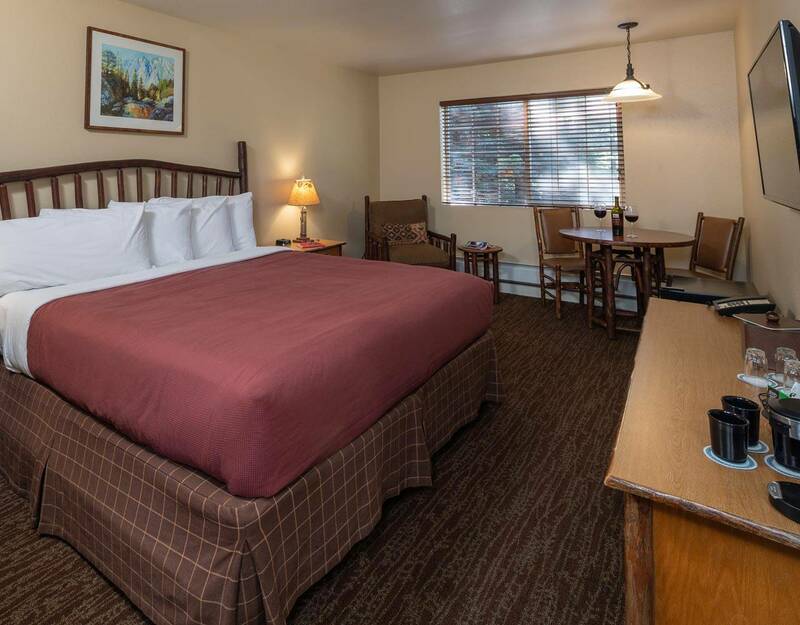 Built in 1998, the John Muir Lodge is an excellent Kings Canyon lodging choice for visitors who want quiet, comfortable, national park accommodations. It features rough-hewn, open beam ceilings, stone fireplace, and a redwood mantel salvaged from a historic cabin in Sequoia National Park. Lodge guests can enjoy games, puzzles, and books in the lobby great room while relaxing by the stone fireplace. Public balconies at the west end of the lodge provide the perfect place to savor the Sierra sunset with friends and family. Wireless internet is available in all common areas of the lodge. Please be aware that because of our remote location, internet service is limited. You will be able to check email and flight information and use some social media sites, but you will not be able to stream video, watch movies, transfer large files or large amounts of data, or use real-time services like voice chat or screenshares. For complete details, please see #8 on our FAQ page. The Lodge’s guest rooms are set with handcrafted wood furniture in a bright and natural light-filled atmosphere. Come evening there is often a glowing fire burning in the fireplace, with guests relaxing in corners of the great room, sharing their day’s adventures. 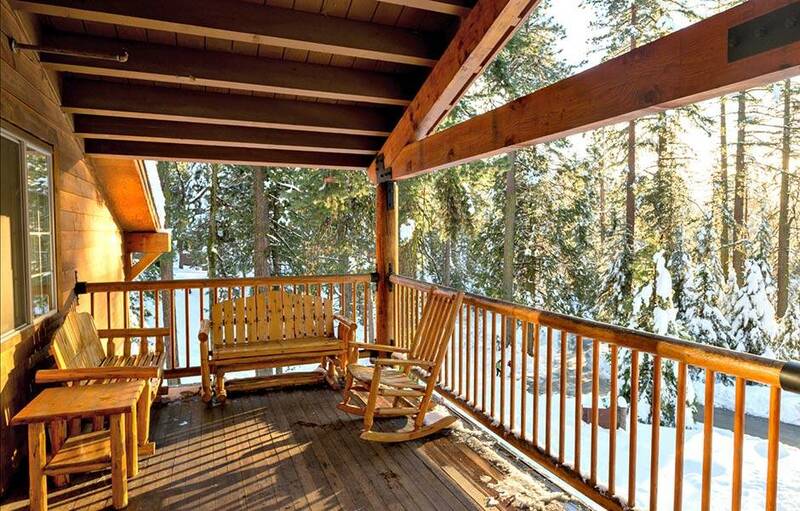 Several porches with chairs and rockers also offer comfortable opportunities for discourse in the fresh mountain air. The family-friendly Grant Grove Restaurant next to the John Muir Lodge features American cuisine for breakfast, lunch, and dinner, with a seasonal espresso bar on the patio. Open year-round, the John Muir Lodge serves California national park visitors with 36 rooms in Kings Canyon National Park. It is named for the famed Scottish author/naturalist who sought to preserve this High Sierra realm and advocated the designation of Sequoia & Kings Canyon as national parks. A painting of Muir, gazing out on the wilderness that stirred him, adorns the lobby of the property, and continues to inspire modern-day Muirs. John Muir Lodge is dog-friendly. The pet fee is $25 per pet, per night. Please review the Pet Policy if you will be traveling with your pet(s). Click here to view Special Events happening in Sequoia National Park. The Standard room is our basic mountain lodge accommodation. Rooms feature two queen beds, as well as a desk and two chairs. Our Standard rooms can accommodate up to four people. The Deluxe rooms feature one king bed, an over sized lounge chair, as well as a desk and two chairs. 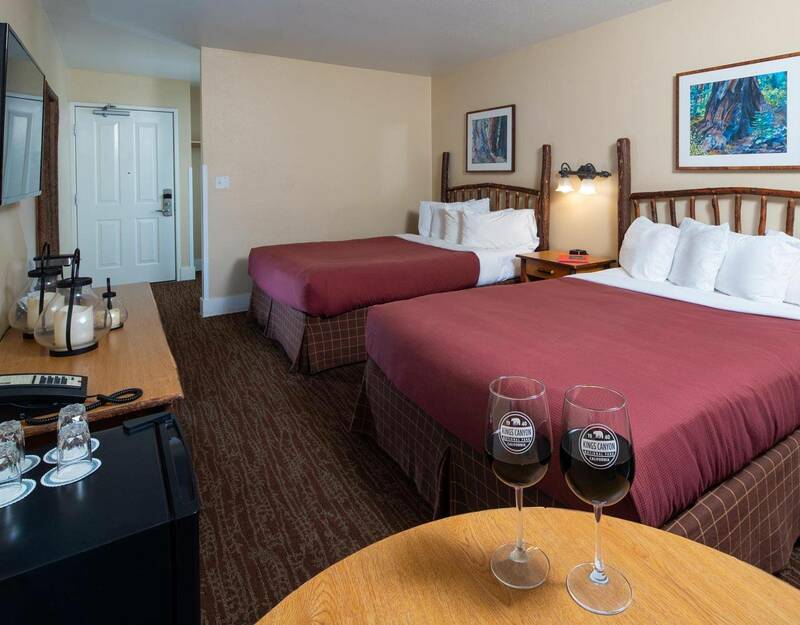 Our deluxe rooms can accommodate up to two people. 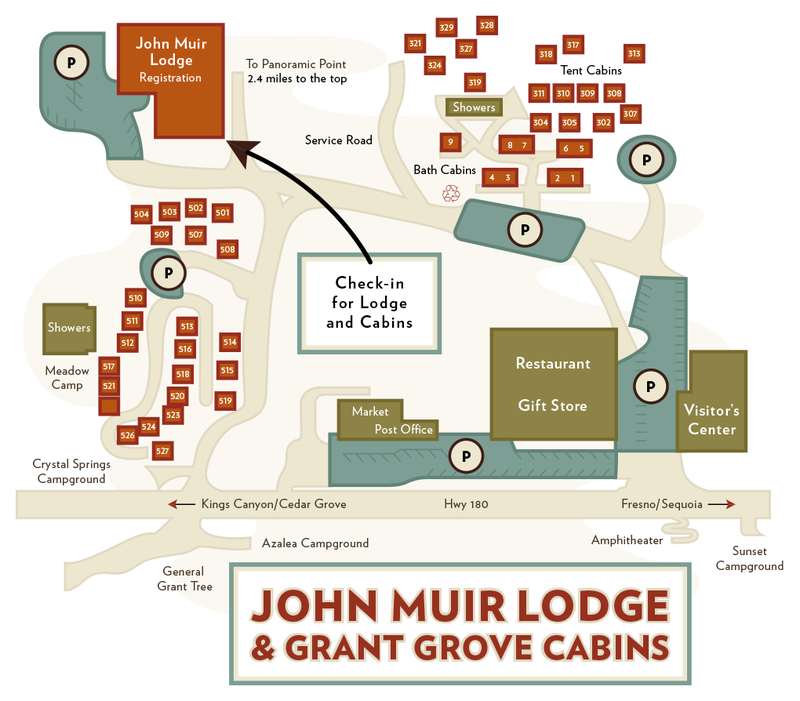 Check-in for John Muir Lodge and Grant Grove Cabins is in John Muir Lodge (see map).